Yerevan, July 17, 2015 — In recent months, the Hayastan All-Armenian Fund has provided apartments to many homeless families in Gyumri. Through a program launched in 2014, the fund has purchased 17 apartments, and already 12 families have moved into their new homes. The apartments are completely renovated and furnished, and feature all modern amenities, including appliances. The apartments were acquired with proceeds from a special Telethon that was held jointly by the fund and the ARTN Shant television station on September 7, 2014. Contributions toward the purchase of the apartments were made by benefactors Antranik Baghdassarian, Vahe Karapetian, Haro Jordan, Haig Keledjian, and Samvel Balasanyan, as well as ARTN Shant Television. Through the initiative of Gilbert Moumdjian, chairman of the fund’s German affiliate, the German-Armenian community also made contributions, which were used to provide homes to the families of Anna Sargsyan and Ruzanna Yeghogyan, both single mothers. All of the program’s beneficiaries once lived in ramshackle huts, metal containers, or rooms in rundown, structurally unsound dormitories, often without access to gas, water, or electricity service, and grappling with terribly unsanitary conditions. Today many of these families have become owners of clean, fully equipped apartments, where they can raise their children with dignity and in comfortable surroundings. “I’ve always done all I could so that my children wouldn’t go hungry, but couldn’t even dream of having a home one day,” Ruzanna Yeghogyan said tearfully. On June 28, 2015, a second special Telethon was held by the Hayastan All-Armenian Fund and ARTN Shant Television, with proceeds to be used for the purchase of additional apartments in the coming months. 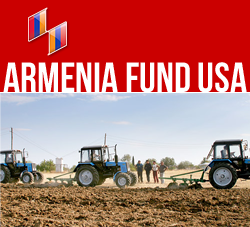 “Providing homeless Gyumri families with apartments will be an ongoing program,” said Ara Vardanyan, executive director of the Hayastan All-Armenian Fund.